FACT CHECK: Did President Trump's Awarding of a Purple Heart to a Wounded Vet Go Unreported by News Media? Did President Trump’s Awarding of a Purple Heart to a Wounded Vet Go Unreported by News Media? Some social media users turned a private moment between Trump and a veteran into accusations of news bias. A photograph showing U.S. President Donald Trump awarding a purple heart to a wounded veteran went unreported by the mainstream news media. This is a genuine photograph of President Trump awarding a Purple Heart to a wounded veteran reportedly named Clint Trial. While the majority of “news media blackout” claims that we’ve encountered — an allegation often levied in an attempt to either spread fake news or to push narratives of biased reporting — have proved false, in this case, it’s true that mainstream news outlets provided little (if any) coverage of this event. So why didn’t this photograph make the news? While many social media users shared this image as “evidence” of the news media’s alleged bias against President Trump, that claim wasn’t supported by what we found. If this were simply a case of “liberally biased” mainstream media outlets ignoring a positive story about President Trump, we would still expect coverage of this event to turn up in conservative-leaning news outlets. However, we found almost no information about this veteran’s receiving a Purple Heart from President Trump in any news outlets, regardless of their perceived political leanings. The only article we could turn up was published in a Pennsylvania newspaper, the Titusville Herald, on 16 February 2019. That paper reported on the event not because of its national importance, but because of the pictured veteran’s family ties to Saegertown, Penn. The Titusville Herald also reported that President Trump’s visit with Trial was unexpected, and that no members of the press were present at the meeting. 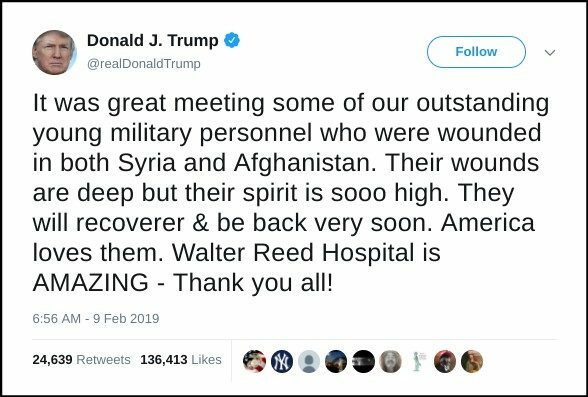 In other words, President Trump didn’t meet with this wounded veteran for a photo op or with the expectation of garnering positive news coverage. A Saegertown boy and his family got an unexpected visit from the President of the United States while meeting with an uncle who was injured in the military. While they were there, Clint was asked if he would be up for seeing a special VIP visitor, according to Gotchy. According to Gotchy, the meet and greet was not political in any way. There was no press at the meeting, and the only pictures taken were by a White House photographer who provided images as keepsakes for the family. The visit became even more special when the president learned that Clint had not yet received his Purple Heart. Casey reached out to the staff at the office with the request that the president be the one who pinned the medal awarded to soldiers wounded in the line of duty on Clint’s shirt. President Trump saved Clint’s visit for last and held an award ceremony with the family present. We haven’t been able to track down the initial internet origins of this image, but it seems likely that the photograph was lifted from one of the personal social media pages of Trial (whose Twitter account is now set to private) or those of one of his relatives, and then turned into a meme and shared (against his wishes for privacy) with his full name. This meme does not appear to demonstrate any news media “bias” against President Trump but rather a private interaction that was never meant to receive press attention. 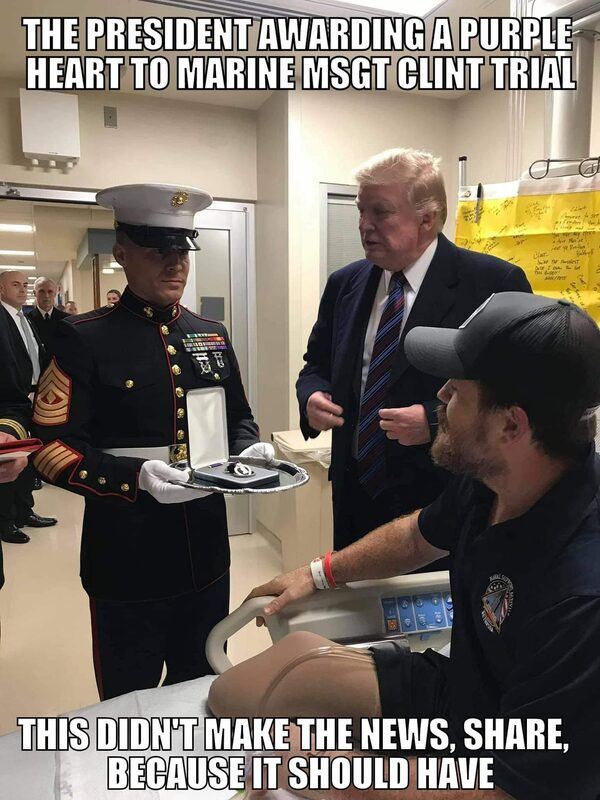 President Trump didn’t meet with this veteran for a photo opportunity, nor did the news media refuse to cover the event out of a desire to provide nothing but negative stories about the president. 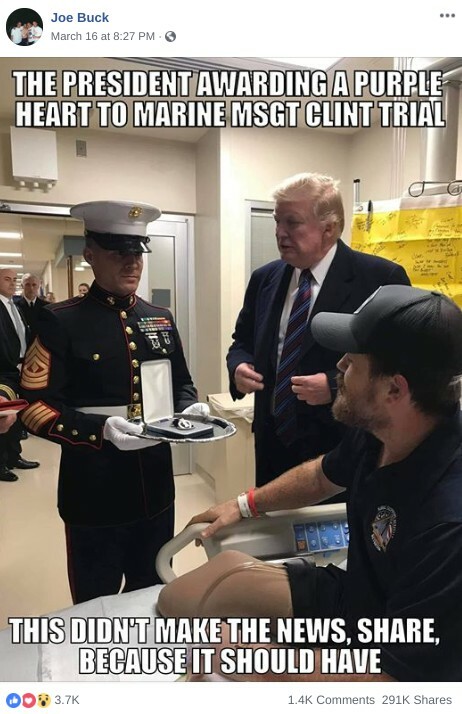 If anything, this meme seems to demonstrate that some social media users will exploit even wounded veterans in order to advance their own political viewpoints. 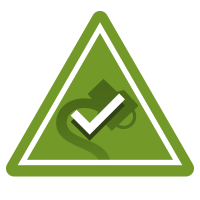 In mid-January 2019, Clint Trial was working overseas when an explosion caused serious injuries to his body, resulting in a bilateral leg amputation, traumatic brain injury, and numerous internal injuries. When you make a contribution to this fund, you will help ease this transition. Money raised with this fundraiser will be used to cover gaps in coverage for care outside of hospital bills, to include vehicle modifications, traveling costs for family members, moving expenses, and construction costs to ensure their house is properly adapted to ADA standards. Titusville Herald. 16 February 2019.